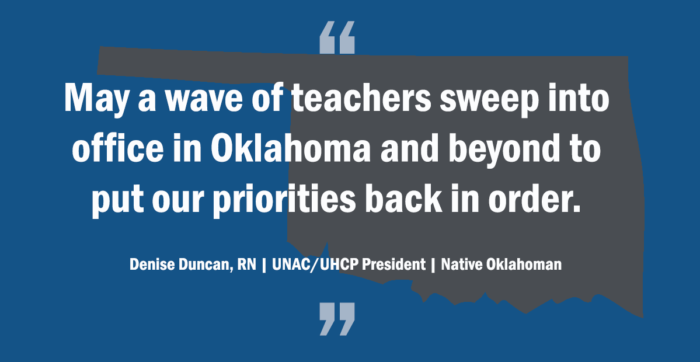 UNAC/UHCP President Denise Duncan, RN, released the following statement regarding the end of the Oklahoma teachers strike. “Fifty thousand teachers, parents and children rallied in Oklahoma City on Monday in support of increased funding for public education and legislators responded by adjourning early and hightailing it out of the capitol. “Their retreat, after complaining about ‘unappreciative teachers’, occurred on the second of the three-day filing period in the state to run for elected office. Reportedly over 400 people registered on just the first day, outraged at how the state has robbed the education system to pay for tax cuts. “As an Oklahoman by birth, I watched with horror as the national news filmed in my home state’s schools and revealed they were falling apart. I heard teachers describe having nearly 40 students in each class and teaching classes where half the class had one textbook and the other half another. This week an Oklahoma student discovered she has the same textbook that Blake Shelton—a 41-year old country music star—once owned. “While underfunding education for decades, Oklahoma cut taxes in the 1990s. In 2003, with revenue lacking, the legislature in their infinite wisdom decided to repeal a trigger that would increase taxes to prevent a budget shortfall. When the recession hit, public education was hit hard. Schools were grossly underfunded. Inflation looted teacher salaries, and teachers increasingly had to pay more of their own health care costs. Folks, that math doesn’t add up. And I pray it doesn’t reflect our priorities as a society.